During the lackluster moments of this year’s Super Bowl, we turned to our second screens. A study released by Flurry today shows that during great ads and the half-time show we kept our devices stowed, but returns from commercial breaks, boring ads, and waning interest in the 3rd quarter caused spikes in mobile app usage. This means advertisers and TV producers need to get flashier, because every viewer has a wildly engaging device in their pocket. Subtle, conservative, slow-building ads just don’t cut it any more. Overall, the Super Bowl was still more popular in the U.S. than apps, with 111 million people watching the game, while 98 million people accessed mobile apps in the same time period. Flurry employed a clever new way to measure how entertaining broadcast content is by charting how our often our fickle population moved to check Facebook, Twitter, and play games. 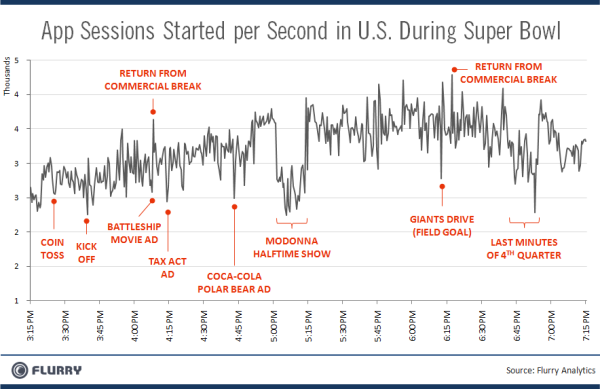 The chart above shows dips in app usage during eye-catching ads for Battleship, Coca-Cola’s polar bears, Madonna’s half-time show, and the tense final minutes of the game — which means the only thing people were doing as the clock ran down was updating social media. Tweets spiked to 10,000 per second in the last 3 minutes, the 2nd highest frequency ever. 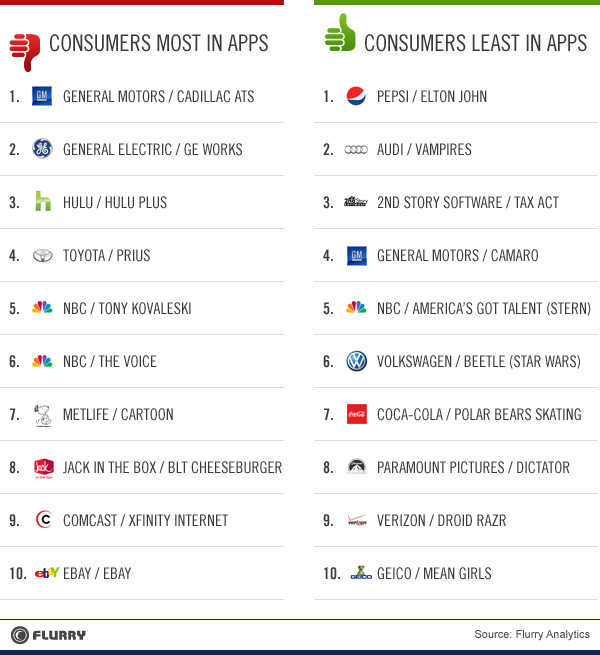 Hulu, General Motors, and General Electric had the most boring ads according to the study, as app usage spiked while they were on screen. Meanwhile, Verizon’s Droid Razr and TaxAct.com’s ads inspired the least compulsive app usage of the tech companies and websites paying for airtime. This year’s Super Bowl was the most watched television program in history and more people in the US watched it than opened apps. Next year the NFL might not be so lucky, though. It will have to analyze what moments caused spikes in app usage, and consider how to jazz them up. The streaming experience could also use some refinement, considering it didn’t show the half time and made users click around to see the commercials.